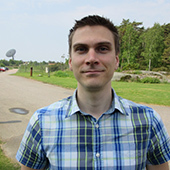 Magnus Persson is part of the division for Astronomy and Plasma Physics group at Onsala Space Observatory. His research focuses on how stars are formed, and how we can use observations of the molecules and dust around them to figure out their structure and evolution. To do this, observations from some of the world's best telescopes are needed, such as the Atacama Large Millimeter/submillimeter Array (ALMA), which is located at over 5 km altitude in the Chilean Andes. The telescope consists of 66 individual antennae which simulates one large telescope with a size of up to 16 km. There might be more projects where Magnus V. Persson participates, but you have to be logged in as a Chalmers employee to see them.